Nuclear Medicine is a subspecialty of radiology which uses a special camera to observe or map radioactive medicine injected into the human body. Typically, a small amount of an appropriate radionuclide is combined or tagged with a certain chemical so that when the mixture is injected it will tend to go to the part of the body we want to "photograph" with our nuclear imaging camera. This might be the heart, thyroid, bones, brain or other body system. Different chemicals are used to direct or cause the material to concentrate in one organ vs. another. We can also introduce the radioactive medicine into the body via food (to study the digestive tract) or via a special breathing mask (to study the lungs). After the radioactive medicine has had time to gather at the body organ of interest (from several seconds to several hours, depending on the chosen drug or radiopharmaceutical) the patient is positioned under the nuclear imaging camera. 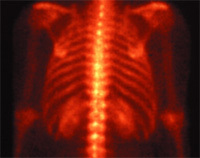 Then either the camera is moved slowly along the body (called a planar scan) or it moves around the body (called a SPECT scan - Single Photon Emission Computed Tomography). It stops periodically to take a "picture" (which consists of accurately detecting the radioactive emissions from the body - rather like having the shutter open for a few seconds). It then moves on a few degrees or a few inches to the next picture location and stops to take another picture. The amount of time the patient remains on the camera table for a typical study varies but can last from 20 to 50 minutes. These pictures are combined to form a larger image. In the case of the planar image, the image combination largely consists of pasting consecutive images together (all in the same 2-dimensional plane). In the case of the SPECT images, a more complex technique called tomography is used to yield a 3-dimensional picture. This same mathematical process is used in other types of radiology imaging such as Magnetic Resonance Imaging (MRI) and Computed Tomography (CT) to generate the "slices" of anatomy which we have all seen . The radioactive medicine will concentrate at the organ of interest as body functions dictate (such as cell activity, blood flow, metabolic rate, etc.). 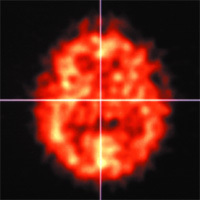 Therefore, the nuclear imaging scan shows function rather than anatomy. This differs from most diagnostic imaging equipment (such as MRI, CT, and standard X-ray) which show anatomy. This is an important distinction as it allows detection of injuries and some tumors (since they are metabolically active) sooner than they might be seen anatomically. The amount of radioactive isotope in the body will gradually decrease. The two factors contributing to this reduction are the natural half-life of the radioactive material (usually 6-48 hrs to decrease by a factor of 2) and the biological half-life (that is, how rapidly the body expels the material). These cause the amount of radioactive medicine to return to near background levels in 1-5 days following injection.